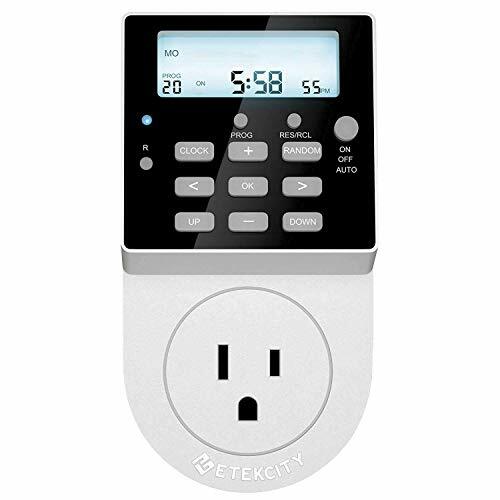 Etekcity Light Timer Outlet - ONLY $10.58! Great for Christmas Lights, Lamps, So Much! Etekcity Light Timer Outlet – ONLY $10.58! Great for Christmas Lights, Lamps, So Much! Score a GREAT DEAL on the Etekcity Light Timer Outlet, Heavy Duty, 7 Day Timer, 20 Programmable Settings, Digital Switch with Backlight and Surge Protection, 15A/1800W today for only $10.58 from Amazon! You will get FREE Shipping if you are a Prime member! If you are not an Amazon Prime member you can grab a FREE 30-Day Trial HERE! Get the all the Details of this deal below! The Etekcity Timer Outlet is the ideal solution for powering your household electronics. Program up to 20 timers that can be set for any time of day for any number of days during the week. The intuitive control panel on this handy device makes it easy to set up timers or the internal clock. The outlet plugs into standard 3-prong sockets and comes with overload and surge protection to prevent any damage to your devices in the event of a power outage. The Etekcity Timer Outlet is perfect for those with limited mobility or hard-to-reach appliances. You’ll be able to automate everyday household electronics to make your home more efficient and convenient. Pet owners can use the outlet to create power schedules for heating pads and lamps for reptiles, fish, and other critters. The outlet is crafted with a high-temperature resistant material, allowing you to power ambient outdoor lights or holiday decorations. You can even provide a sense of security for your home with the timer outlet. The random timer mode allows the outlet to turn on in one-hour intervals within an 18-hour span. This gives the appearance that someone is occupying your home. Many household appliances and devices consume energy even when you aren’t using them, which wastes valuable energy and increases your electric bill. By powering your home electronics with the Etekcity Timer Outlet, creating energy-efficient schedules has never been easier. 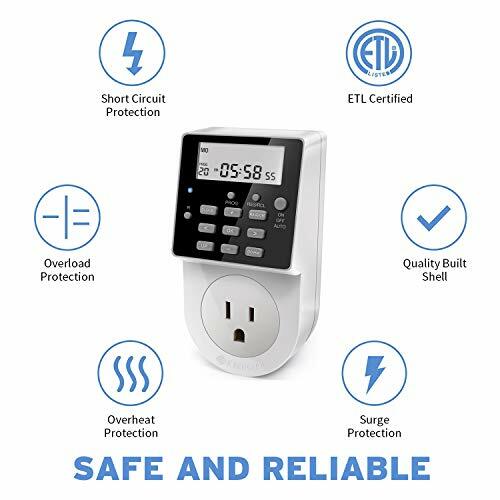 Don’t miss this deal at Amazon Today on the Etekcity Light Timer Outlet, Heavy Duty, 7 Day Timer, 20 Programmable Settings, Digital Switch with Backlight and Surge Protection, 15A/1800W for only $10.58! Previous Post: Kitchen Utensil Accessories 3 Piece Set for ONLY $6.49! Next Post: Steam Train Locomotive Bubble Blowing Train w/Lights & Sounds – $11.50!